University delays issuance of diploma following couple’s public display of commitment. On June 22, Jean Ouyang, surrounded by friends and classmates, got down on one knee and proposed to her girlfriend Nie Xiaoyu. 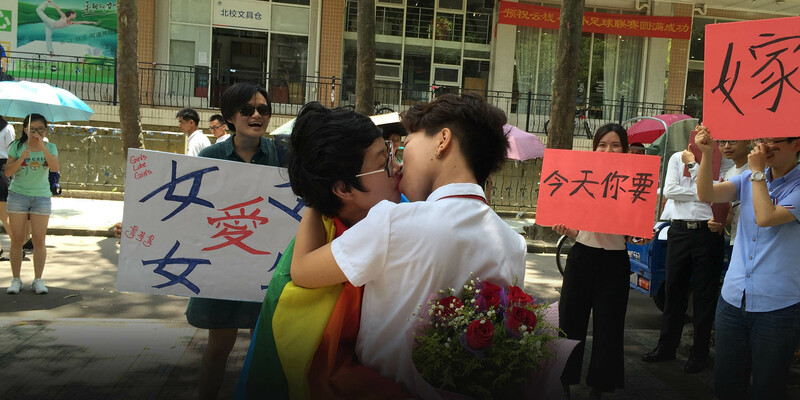 The display of love and commitment has pitted the lesbian couple against their university, in an incident that has caused uproar in China’s LGBT community. 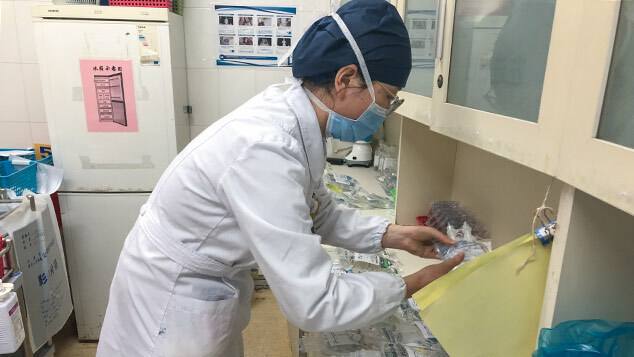 For the two women, both recent graduates of Guangdong University of Foreign Studies (GDUFS) in China’s southern Guangdong province, it was their way of not only coming out in the company of classmates, but also increasing campus awareness of LGBT issues. A consequence of the public proposal that the pair did not anticipate, however, was an investigation by the university into the couple’s actions, culminating in threats to withhold Nie’s diploma. “She said that only once the school’s discipline committee had contacted me to resolve the matter would I be allowed to collect my diploma,” Nie said. Another member of staff at Du’s office said that they were unable to comment on the incident but would pass on Sixth Tone’s questions to a senior member of the university’s publicity department, who would respond to them. At the time of publishing, Sixth Tone had not received any further communication from the department of publicity. 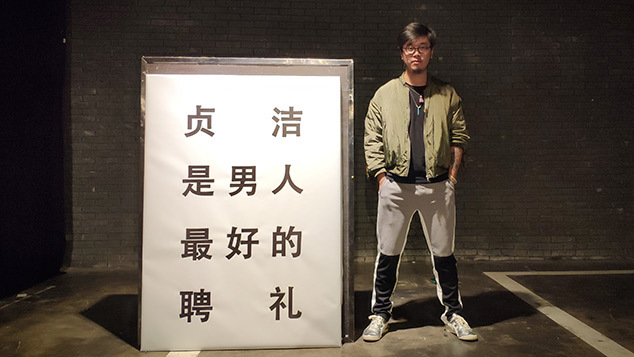 Nie’s girlfriend Ouyang, a student in the university’s law department, was allowed to pick up her diploma without incident, she told Sixth Tone. She was, however, advised by her supervisor not to attend her graduation ceremony, which took place the following day on June 23. That same supervisor had also asked her a number of personal questions regarding her sexuality, she said. Ouyang did not want to reveal her full Chinese name for fear of being harassed. Nie said that the episode had had a damaging effect on the emotional state of her father, who was not previously aware of Nie’s sexuality. When she did not return home on the night of June 22, he called the police and filed a missing person report, which led to the authorities — accompanied by Secretary Du — to visit her place of residence. In an open letter published Tuesday to her Weibo microblog, Nie wrote that the supervisor had, among other things, asked Ouyang: “In your relationship, what role do you play? 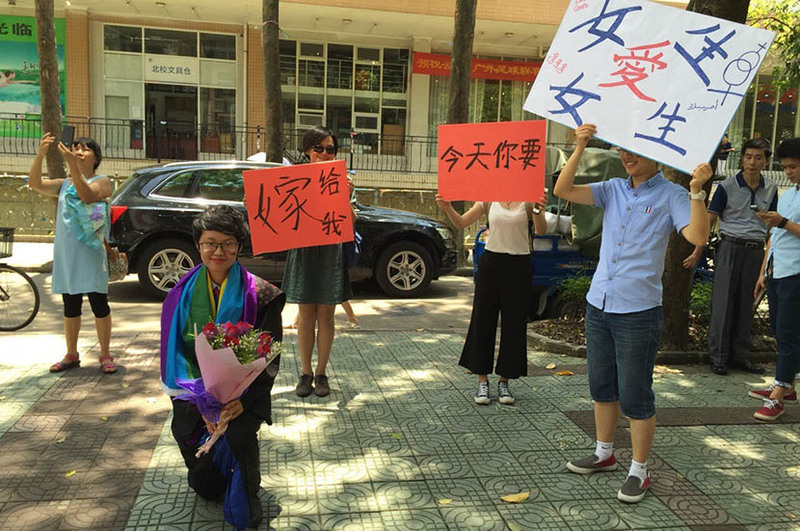 Dominant or submissive?” Nie has since deleted the open letter out of concern for her parents, but it has been shared widely by other platforms, including feminist non-governmental organization Gender in China. While Ouyang hopes that the university will not contact them again, Nie’s open letter asks the university to accede to six requests. Among them, Nie asks for a public apology from Secretary Du for the damage done to her and her family, and calls for GDUFS to establish a supervisory committee to eliminate all homophobic teaching materials from campus.